Skyrim's procedurally-generated quests make it the kind of game that fans can play forever. Did Oblivion and Morrowind feel a little small to you? A little cramped, a little short? If so, then I have some good news: Skyrim, the latest chapter in the Elder Scrolls series, features procedurally-generated quests that will give players an endless list of things to do, even after the game's various plotlines are wrapped up. Random NPCs will offer tasks as you work through the game and jobs will also be available from the game's various factions, even after their quest lines are completed. "The vibe of the game is that it's something that you can play forever," Skyrim Director Todd Howard told Wired. Helping make that system work will be secrets and random pick-ups that players will discover as they quest. Howard said Bethesda learned a lot about "environmental storytelling" while working on Fallout 3 and got better at it with Skyrim. 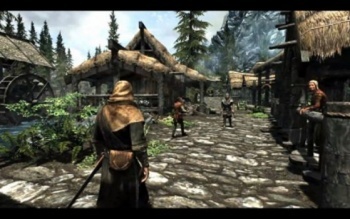 "The world is probably the one thing that sets [Skyrim] apart from other games," he said. "It feels really real for what it is... It's just fun to explore." The potential downside to procedural generation, as any Daggerfall veteran can tell you, is repetition. Daggerfall was a huge game with a nearly limitless supply of dungeons but once you'd been through enough of them you couldn't help but notice that they were all rather same-y. 15 years down the road, Skyrim will presumably be better, but how it will avoid that trap - or for how long - remains to be seen. We'll find out soon enough: The Elder Scrolls V: Skyrim comes out on November 11 - just two freakin' days! - for the Xbox 360, PlayStation 3 and PC.